With a blasting, cold northery to contend with fieldwork wasn't exactly a pleasure today. 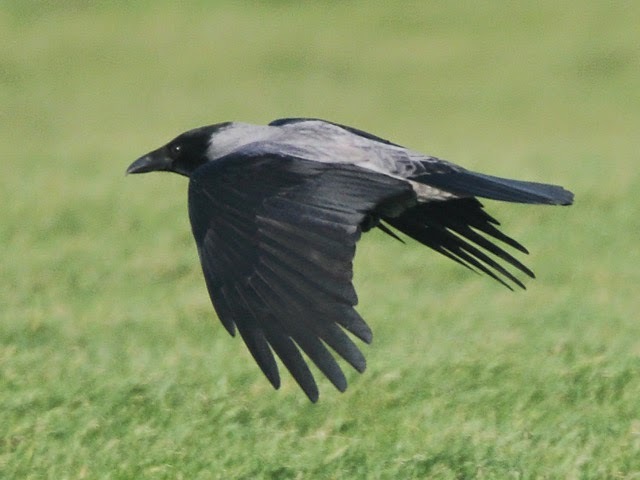 The only additions to the sightings of recent days were a Merlin over the Windmills and 2 Kittiwakes that ventured into Portland Harbour; otherwise there was little change, with 7 Purple Sandpipers, 2 Blackcaps and a Chiffchaff at the Bill, another Chiffchaff at Weston, the Hooded Crow at the Grove pig farm and 3 Eider and the Black Guillemot in Portland Harbour (along with, according the news services, a miscellaneous selection of divers and grebes there). In markedly improved conditions there was considerably more coverage today. The Bill came up with a routine tally of 6 Purple Sandpipers, a Blackcap and a Chiffchaff on the land and 2 Red-throated Divers through on the sea, whilst a long walk up the east side of the island failed with a Wallcreeper - one day it'll be there - but saw Great Spotted Woodpecker, Chiffchaff and Firecrest at Pennsylvania Castle and Black Redstart at East Weare make the tally; the Hooded Crow was also still at the Grove pig farm. 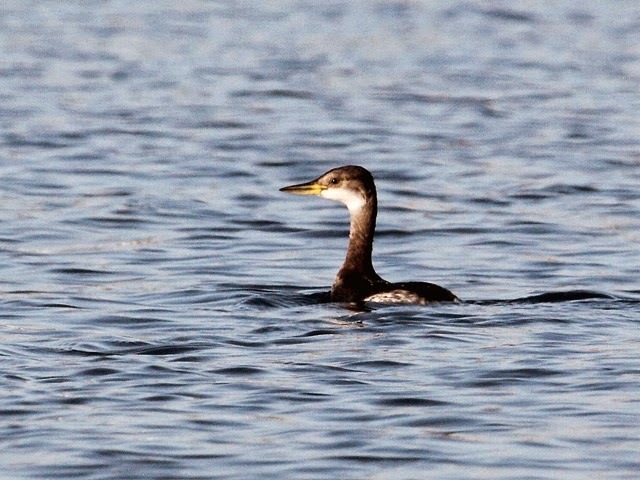 Portland Harbour returned totals of 21 Black-necked Grebes, 3 Slavonian Grebes and singles of Black-throated Diver, Common Scoter and Black Guillemot. 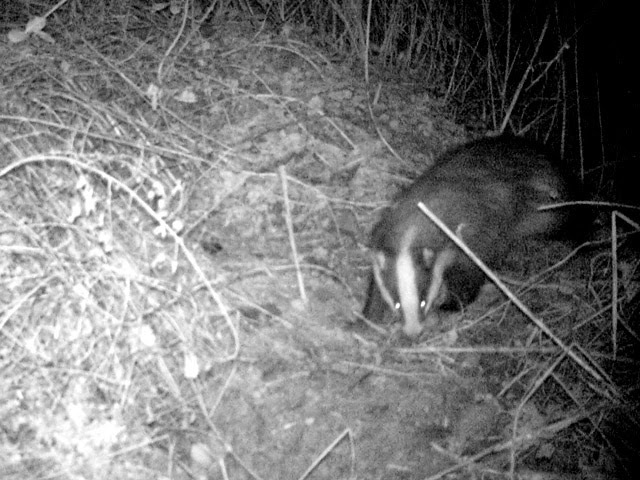 ...having seen plenty of signs of Badger activity in the Obs garden this winter we've had the camera trap out quite a bit just lately, but by virtue of bad luck or poor placement have kept getting arse-end images of our quarry. For a change, last night we tried the known sett at the Bill and that returned some much more satisfactory results including the image above. Very showery and unpleasantly cold in the vicious wind today. Apart from the discovery of a second Red-necked Grebe in Portland Harbour the day's fieldwork did little more than confirm the continuing presence of many of the winterers: 2 Blackcaps and a Chiffchaff at the Obs, the Hooded Crow at the Grove and 18 Black-necked Grebes, 3 Slavonian Grebes, 2 Red-necked Grebes, 2 Eider and the Black Guillemot in Portland Harbour. In mightily unpleasant conditions - a dreary, damp start giving way to a blasting and very cold northwesterly - a Great Skua lingering off the Bill for the best part of the morning was the only newcomer of note; 6 Purple Sandpipers and 2 Blackcaps were still at the Bill, the Hooded Crow was again at the Grove pig farm and the Black Guillemot remained off Portland Castle. In tandem with the soaring temperature once the sun came out the day's list increased in leaps and bounds, albeit not including much that wasn't already well established for the winter. The Black Guillemot off Portland Castle and the Hooded Crow at the Grove were again the best of the bunch, but also making the tally were 8 Red-throated Divers, 2 Common Scoter and a Brent Goose through off the Bill, 5 Purple Sandpipers and 2 Blackcaps still on the land there, a Chiffchaff at Weston, a Black Redstart at Portland Castle and 15 Black-necked Grebes, 4 Eider, a Black-throated Diver and a Red-necked Grebe in Portland Harbour; small increases in Stonechats at Reap Lane and Ferrybridge - 4 at each - were perhaps a hint of things beginning to move about a bit in the decent conditions. 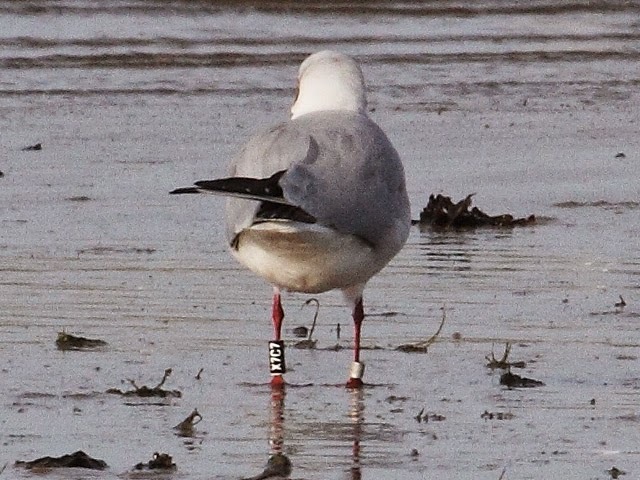 ...since a good proportion of UK wintering Black-headed Gulls originate from breeding sites in countries bordering the Baltic Sea there's nothing at all odd about the ringing location of this bird - it was marked as an adult in May 2013 at a colony on the coast of north-east Germany - but as it's colour-ringed we've featured it in case anyone else spots it this winter; thanks to Will Bown for taking the trouble to obtain the ringing details. It's a sad reflection both of the quality of the day's observations and the sorry state of the local Greenfinch population that this winter's peak count of the latter at the Obs - just 17 birds - should be worth a meritorious mention. 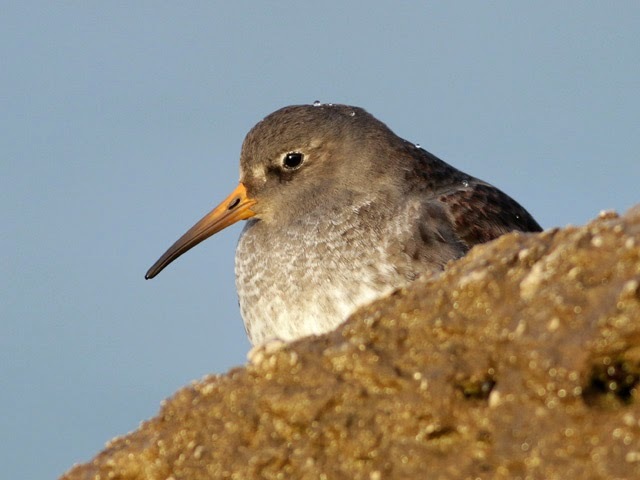 The only other reports were also from the Bill: 4 Purple Sandpipers and 2 Blackcaps on the land and 6 Red-throated Divers through on the sea. ...proving rather more resilient than the Barred Warbler, these two Blackcaps arrived in mid-November and - quite unusually for the Obs where Blackcaps rarely linger much beyond the New Year - are still going strong. 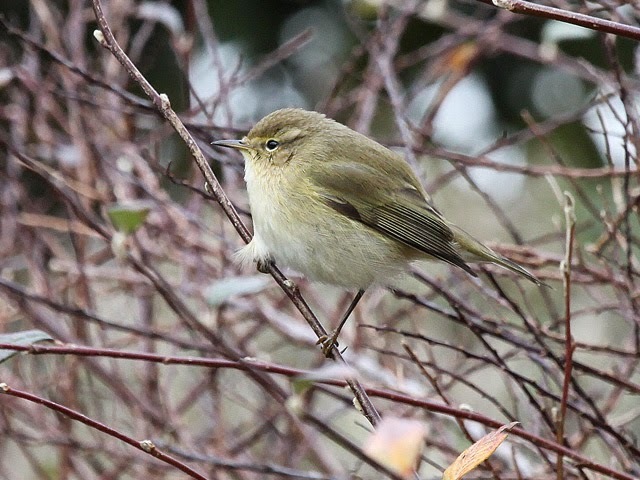 We learnt today from Charlie Richards that another two - males in this case - have been frequenting a well-provisioned garden at Fortuneswell all winter, whilst another single evidently visited a garden at the Grove last week; how many others are lurking in private gardens around the island? 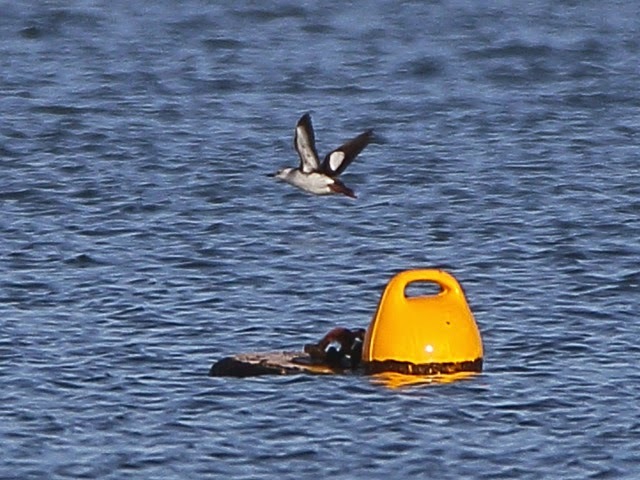 Today's only slight change was an increase to 20 in the Black-necked Grebe total from Portland Harbour; 3 Great Northern Divers, a Red-necked Grebe and the Black Guillemot were also there. Elsewhere, 21 Red-throated Divers passed through off the Bill, 5 Purple Sandpipers, a Black Redstart and at least 1 Blackcap were still knocking about on the land there, another Black Redstart was at Cheyne and the Hooded Crow was still at the Grove. 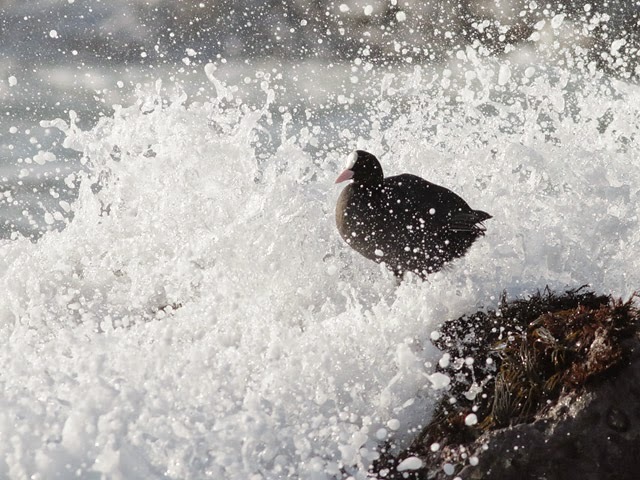 This week's Coot aside(!) 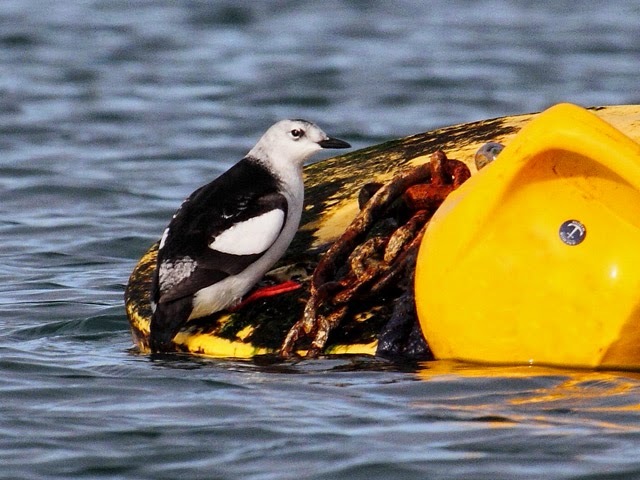 winter birding has rather stagnated just lately and without a pretty profound shake-up in the weather it's hard to see much changing until the first spring migrants start showing up next month. Today's samey batch of sightings included the Black Guillemot off Portland Castle, the Hooded Crow at the Grove, 4 Purple Sandpipers, 2 Blackcaps and a Chiffchaff at the Bill and 11 Red-throated Divers through on the sea off the Bill. ...sadly nothing to do with Portland but always a good bird for the Weymouth area and, in this case, a first for Radipole. The Bill received plenty of coverage and it was the sea that returned the numbers, with 27 Red-throated Divers, 9 Common Scoter, 6 Brent Geese and 6 Wigeon through during the morning; on the land a Reed Bunting was a first for the year - although in all probability previously overlooked, whilst 2 Redwings, a Blackcap and a Chiffchaff lingered on. Elsewhere, another Chiffchaff was at Easton and the Black Guillemot was still off Portland Castle. 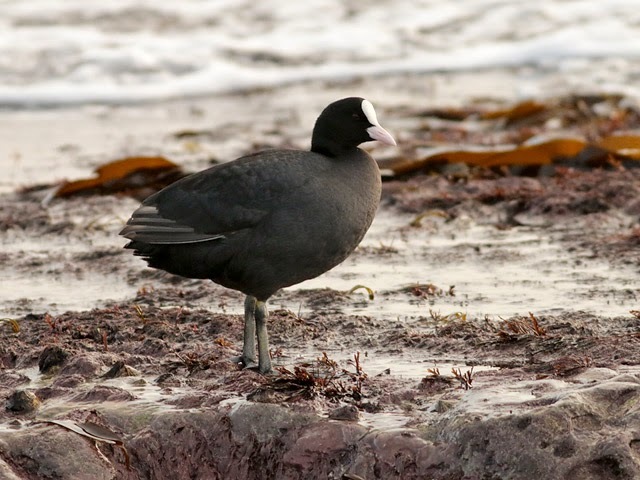 With the rain of the last couple of days replaced by pleasant sunshine there was a lot more incentive to venture out, with the chief reward coming in the form of a Coot at the Bill - only the sixth record there and the first for 34 years. 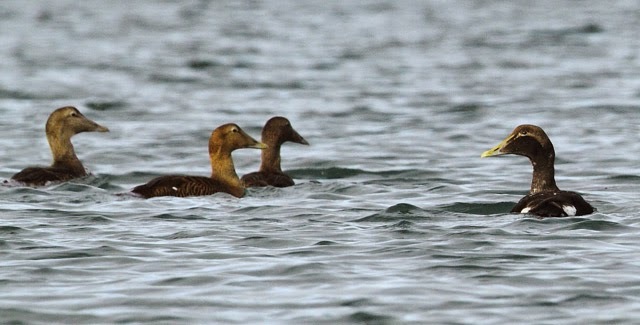 The day's other sightings were considerably more mundane: 4 Purple Sandpipers, at least 2 Water Rails, 2 Blackcaps and a Chiffchaff remained at the Bill where 14 Red-throated Divers, 4 Common Scoter and a Great Northern Diver passed by on the sea, another Chiffchaff was at Easton and the Black Guillemot was still off Portland Castle. 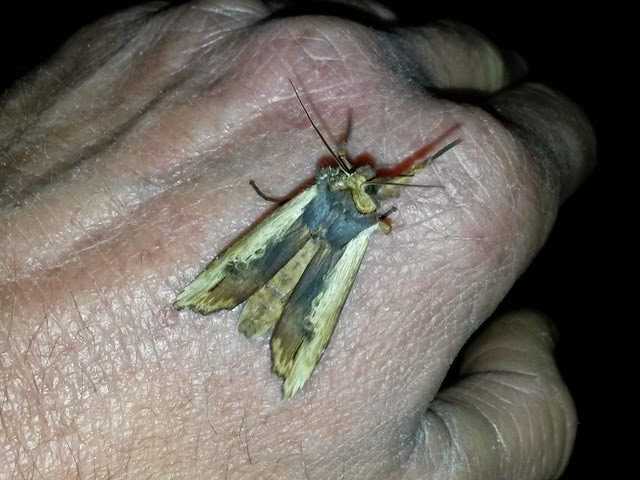 Overnight a Red Sword Grass attracted to the lit Obs porch was an unexpected find and constitutes only the tenth recent record for the island. Yesterday's onset of rain proved to be just the beginning of almost 24 hours of drizzle or heavier bursts that finally petered out towards midday today - conditions that again kept nearly everyone indoors. 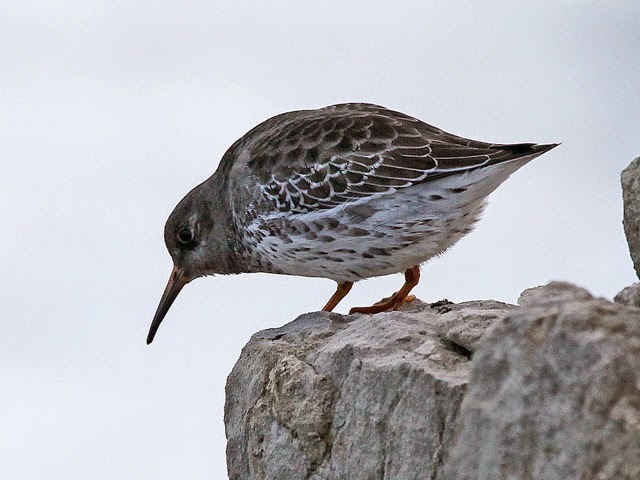 What reports there were didn't amount to much: 5 Purple Sandpipers, 2 Blackcaps and singles of Black Redstart, Redwing and Chiffchaff at the Bill, 3 Red-throated Divers through on the sea there, the Black Guillemot still off Portland Castle and 160 Dunlin and a Redshank at Ferrybridge. A rather innocuous dawn belied what was to follow once persistent drizzly rain and a freshening and increasingly raw south-easterly set in. With precious few reasons to step outside after mid-morning the day's only reports were of both the Black Guillemot and Hooded Crow still about off Portland Castle and at the Grove pig farm respectively, 2 each of Black Redstart and Chiffchaff at Portland Castle, 4 Eiders, 2 Slavonian Grebes and a Great Northern Diver in Portland Harbour, 8 Purple Sandpipers and a Blackcap still at the Bill and 29 Red-throated Divers and a Common Scoter through on the sea off the Bill. Another lovely day of light winds and almost unbroken sunshine - perfect winter birding conditions. Surprises were few and far between but many of the regulars were showing nicely, with Portland Harbour and environs particularly rewarding: 2 Wigeon were new arrivals, 7 Slavonian Grebes, 4 Eider, a Red-necked Grebe and the Black Guillemot were the best of the bunch amongst the waterbirds and 2 each of Black Redstart and Chiffchaff were at Portland Castle. Further single Black Redstarts were at Blacknor and the Bill, with the latter also coming up with 12 Purple Sandpipers (the highest count so far this winter), a Grey Heron and at least 1 of the Blackcaps on the land and 8 Brent Geese, 7 Red-throated Divers and a Common Scoter through on the sea. 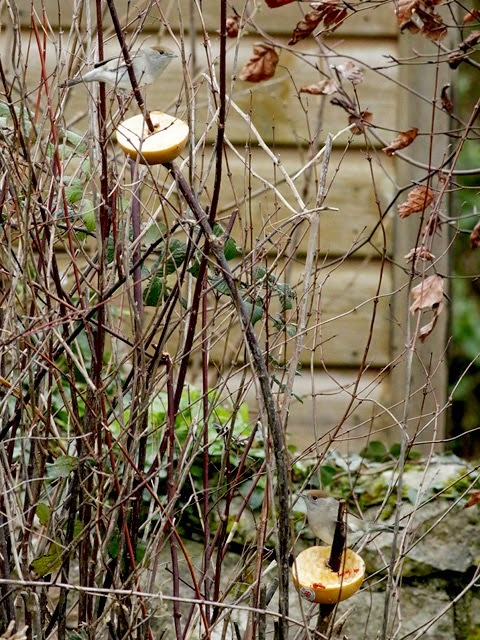 A right old mid-winter miscellany on a lovely crisp but sunny day. If roam-about releases count as highlights then yet another Great Bustard flypast - this time involving a single that headed north over the island just after midday - was certainly the spectacle of the day. There was precious little else that was new, but 4 Goldcrests and 2 Firecrests at Foundry Close were additions to the wintering tally of those species; regulars included 8 Purple Sandpipers and the 2 Blackcaps at the Bill, singles of Grey Heron and Chiffchaff at Southwell, the Hooded Crow at the Grove, 2 Black Redstarts at Portland Castle and the Black Guillemot, 3 Eider and a selection of divers and grebes in Portland Harbour. 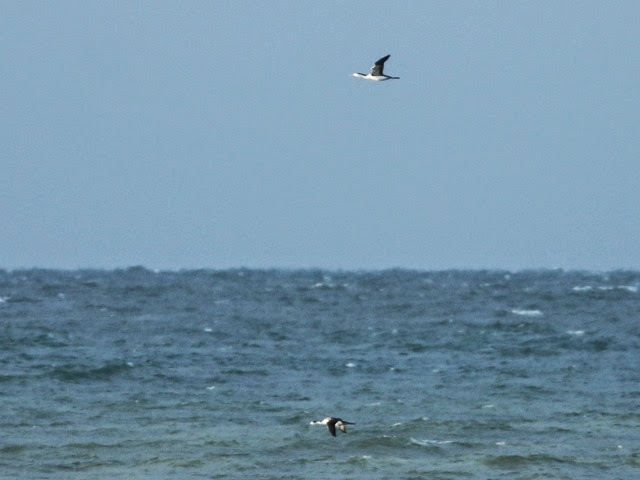 Seawatching at the Bill came up with 14 Red-throated Divers, 4 Common Scoter, a Brent Goose and a Pomarine Skua. ...although the Common Sandpiper - which was on the shore at Bincleaves - was really outside our recording area we'll take the liberty of including it here as it did fly over harbour waters from time to time; it's of some interest since the views today finally put to bed any doubts about the identification of a bird that calls quite oddly and had hitherto only been seen in flight or at great distance - thanks to Joe Stockwell for being alert to its presence in the first place and to Will Bown for tracking down where it was hiding. We're sure there must have been folk looking elsewhere on a fair weekend day but pretty well all the reports we received were from the Bill where 6 Common Scoter, 3 Red-throated Divers, 2 Shelduck, a Great Northern Diver and a Great Skua passed through on the sea and 7 Purple Sandpipers and 2 Blackcaps were still about on the land elsewhere, a Black Redstart was at Fancy's Close, Easton. A welcome upturn in the weather: blue skies, pleasant sunshine and very little wind for the best part of the day. Fieldwork came up with many of the regulars but not a great deal else besides, with 6 Linnets and a Fieldfare at the Bill, 2 Rooks at Ferrybridge and an increase to 7 Great Northern Divers in Portland Harbour being the best of a motley selection of additions. 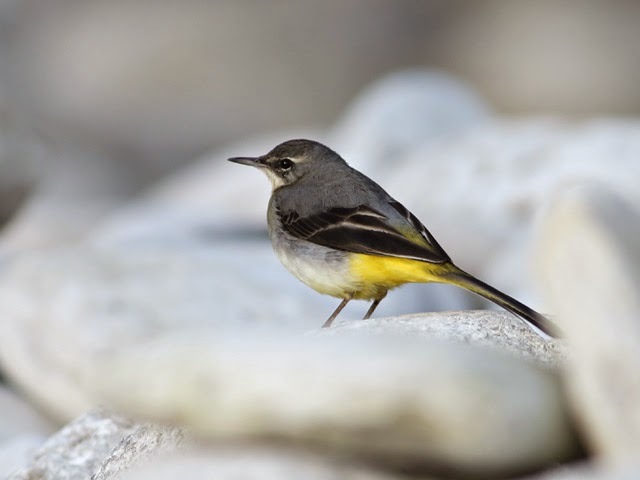 Five Purple Sandpipers and 2 Blackcaps were at the Bill, where 3 Red-throated Divers passed through on the sea, 2 Goldcrests and singles of Great Spotted Woodpecker, Grey Wagtail and Firecrest surfaced in the sunshine at Pennsylvania Castle/Church Ope Cove, a Black Redstart was still at Portland Castle and 4 Eider, a Red-necked Grebe and the Black Guillemot were in Portland Harbour. After another night of weather excesses - did we hear correctly that overnight Portland Bill was the windiest place in south-west England? 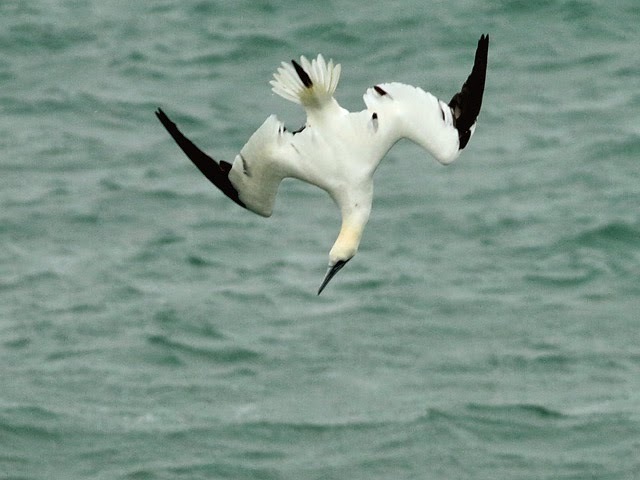 - there was a conspicuous/predictable lack of action on the sea where the only morsels of interest concerned single Red-throated Divers settled off Chesil Cove and the Bill. Elsewhere the 2 Blackcaps remained at the Obs, the Hooded Crow was still at the Grove and 15 Black-necked Grebes, 5 Slavonian Grebes, 2 Great Northern Divers and an Eider were in Portland Harbour. Coverage-wise, today was a bit of a shocker even though the daylight hours actually turned out to be something of a window of opportunity between a pretty fierce weather front that passed through overnight and the onset of yet more wind and rain towards dusk. 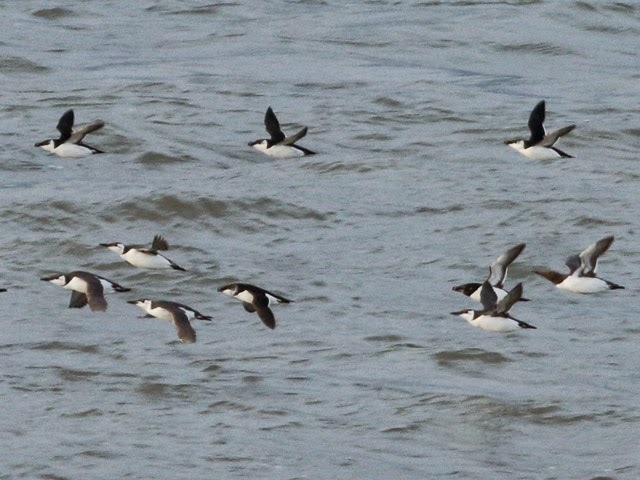 A Velvet Scoter that passed though off the Bill was easily the bird of the day; the only other reports were of the 2 wintering Blackcaps still at the Obs and an increase to 7 in the Slavonian Grebe tally in Portland Harbour. A surprisingly number of observers about for a blustery, chilly and at times wet mid-week day. Many of the regulars put in appearances, including 2 Pale-bellied Brent Geese at Ferrybridge, 15 Black-necked Grebes, 3 Great Northern Divers, 3 Slavonian Grebes, 2 Eider and the Black Guillemot in Portland Harbour, a Black Redstart at Blacknor, the Hooded Crow at the Grove, 6 Purple Sandpipers, a Redwing and a Blackcap at the Bill and 2 Common Scoter and a Red-throated Diver through off the Bill. With the constantly windy and frequently wet conditions beginning to look depressingly reminiscent of last January there was limited enthusiasm for trudging the land, where the only sightings of note today concerned 6 Purple Sandpipers and at least 1 of the Blackcaps still at the Bill. The sea has been coming up with plenty of birds to look through in recent days - at the Bill this morning auks were passing at 1500/hour and 200 fishing Gannets were a constant presence - but quality hasn't exactly been a feature, with nothing more than 14 Brent Geese (rather oddly, looking as through they'd arrived from across the Channel) and a lone Red-throated Diver through off the Bill today. 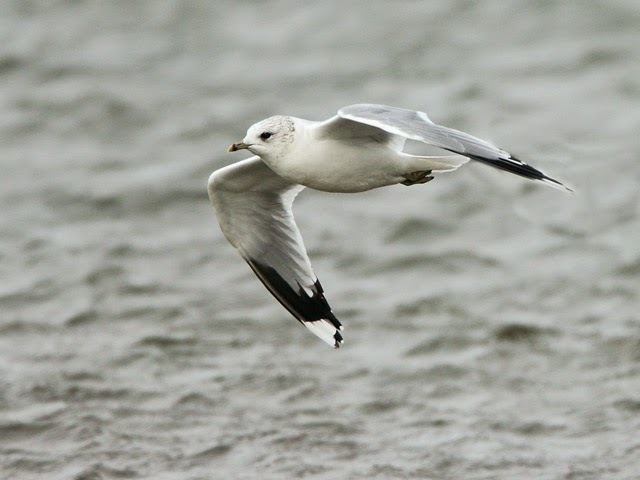 ...we've always been puzzled by the peculiarly disjunct winter distribution and feeding ecology of Common Gulls in south Dorset: at the Bill they have all the look of a more of less true pelagic species - indeed they often outnumber Kittiwakes amongst the offshore feeding flocks, whilst in Weymouth they're a mix of day-time loafer - sometimes in the hundreds if the conditions are right at Radipole - and afternoon/evening fly-over en route to Weymouth Bay where often many thousands that have spent the day feeding in fields all across inland Dorset gather to roost; in contrast to the relative abundance at these sites, on the mud-flats at Ferrybridge/Portland Harbour it's unusual to see more than double figures at a time before migrants start to drop in during February (and even then decent counts are infrequent). Are the birds we're seeing dip-feeding for surface scraps off the Bill the same individuals every day, or are they with us one day before heading off to pull earthworms from a sheep pasture on the mid-Dorset downs the next day? Plenty of weekend coverage saw many of the regulars make the list today, including the Hooded Crow at the Grove pig farm, 13 Black-necked Grebes, 5 Slavonian Grebes, 3 Great Northern Divers, 3 Eider and the Black Guillemot in Portland Harbour, a Black Redstart at Portland Castle, a Pheasant and a Chiffchaff at Southwell, 4 Purple Sandpipers, 2 Black Redstarts and a Blackcap at the Bill and 2 Common Scoter and a Red-throated Diver through on the sea there. A samey vein of weather and rather repetitious birding at the moment. 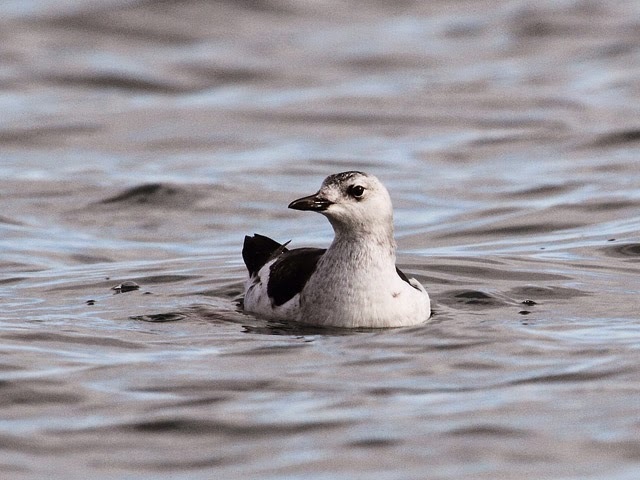 Three Purple Sandpipers and 2 Blackcaps were again at the Bill, singles of Red-throated Diver and Great Skua passed through on the sea there and singles of Great Northern Diver, Eider and Black Guillemot were in Portland Harbour. A blustery but very mild day that saw nothing much change. The Hooded Crow and the Black Guillemot at the Grove and off Portland Castle respectively got most of the attention, whilst the 2 Blackcaps remained at the Obs and a lone Red-throated Diver passed through off the Bill; a count of 16 Greenfinches at the Obs was the highest there this winter - a sad reflection on the current demise of what until recently was one of the commonest mid-winter inhabitants of the garden. A very wet start to the day - even though the sun was out by mid-morning - kept most people indoors and the only reports were of the Hooded Crow still at the Grove, 4 Red-throated Divers, 2 Great Skuas and a Common Scoter through off the Bill and at least 1 of the Blackcaps still at the Obs. Although the promised rain largely held off until late in the afternoon today was an uninspiring mix of dreary skies and a chilly and constantly freshening wind. 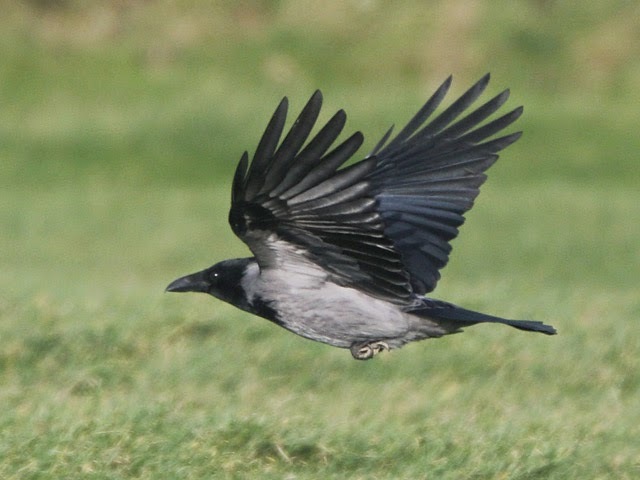 Although nobody imagined it had actually left the island there hadn't been any reports of the Hooded Crow for several weeks, so it was good to glean belated news that it had been seen a couple of days ago; today it was showing as before amongst the mass of Carrion Crows and Jackdaws around the Grove pig farm. Given the conditions and the good numbers of birds still off the Bill it was no surprise that a lingering Great Skua was still about, but a passing Manx Shearwater there was of much higher value for the season; 2 Red-throated Divers also passed through off the Bill and another Great Skua passed through at Portland Harbour. Winterers included 3 Purple Sandpipers and 2 Blackcaps at the Bill and 3 Eider and the Black Guillemot in Portland Harbour. More of the same today with many of the long-established winterers remaining on station. 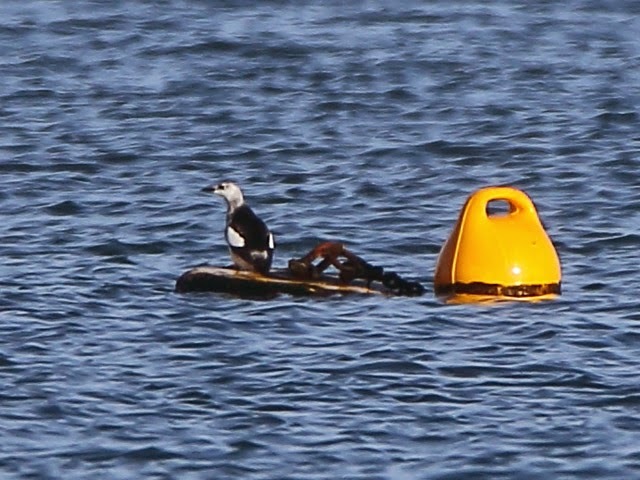 The 2 Blackcaps were still at the Obs, 4 Red-throated Divers and a Pomarine Skua passed through off the Bill, both the Chiffchaff at Southwell and the Firecrest at Pennsylvania Castle put in appearances and 15 Black-necked Grebes, 4 Great Northern Divers, 3 Slavonian Grebes, 2 Eider and the Black Guillemot were in Portland Harbour. Normal winter service resumed today after a month when first the Barred Warbler and then the long holiday break brought about a birding footfall more akin to the migration seasons. A fairly mundane list from the day included 9 Red-throated Divers, a Black-throated Diver and a Great Skua through off the Bill, 3 Purple Sandpipers and 2 Blackcaps still about on the land there, the Black Guillemot still off Portland Castle and 2 Pale-bellied Brent Geese at Ferrybridge. 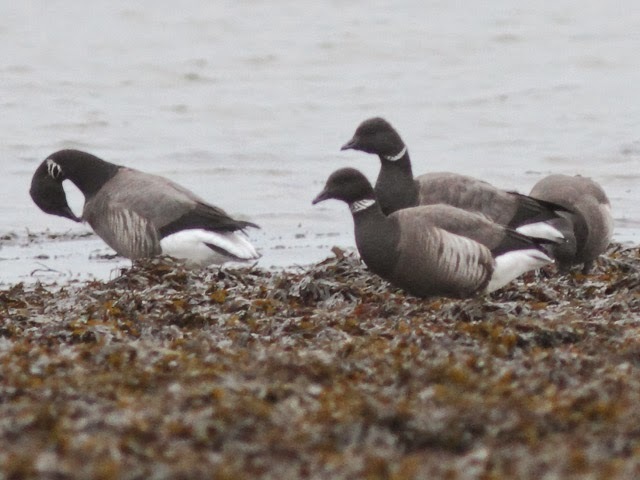 ...thanks to Debby for bringing the Brant look-alike at the front of this group to our attention - evidently it was present at Ferrybridge yesterday as well as this morning; it's likely just an extreme Dark-bellied Brent but the presence of a few faint streaks of white between the neck patches, as well as the relatively bold flank patch, perhaps hint at some lurking Brant genes. The presence of an array of bird-racers and year-listers making the most of chilly but otherwise rather benign conditions ensured the established winterers got plenty of attention today. A seemingly very brief visit for the first time in several weeks by a Black Brant to Ferrybridge was notable although unfortunately it escaped the attention of most; a Pale-bellied Brent was also there, whilst across the road in Portland Harbour the Black Guillemot and singles of Black-throated Diver and Red-necked Grebe were of interest amongst the more routine divers, grebes (including an 'extra' Slavonian Grebe) and Eider. Chesil Cove came up with 2 Red-throated Divers, with another 24 through off the Bill where 4 Common Scoter, 3 Great Skuas and a Little Egret also passed by; 6 Purple Sandpipers, 2 Blackcaps and at least 1 Water Rail also remained at the Bill. 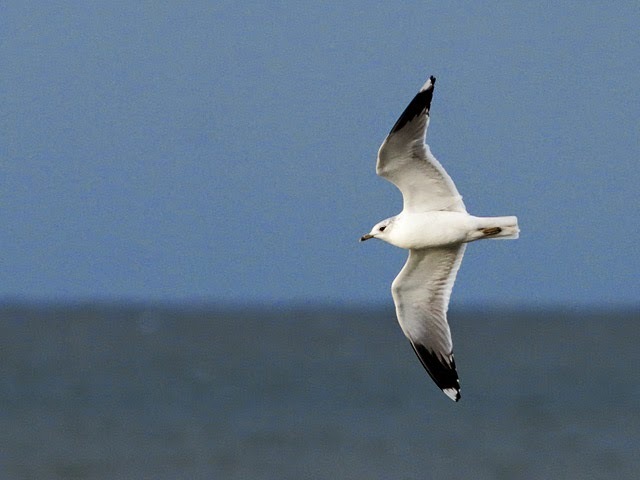 ...gulls, Gannets and occasional attendant skuas remain quite a spectacle off the Bill. The quest by a good many visitors for year-ticks ensured better coverage than might have been expected after the overnight return of soggy conditions. Sadly there were precious few new discoveries, with an almost identical list to recent days: 10 Brent Geese, a Red-throated Diver and a Great Skua passed through/lingered off the Bill, 3 Purple Sandpipers and a Blackcap remained on the land there, 2 Blackcaps and 2 Chiffchaffs lingered on at Pennsylvania Castle, 6 Pale-bellied Brent Geese were at Ferrybridge and the Black Guillemot was the highlight amongst the customary selection of divers, grebes and Eiders in Portland Harbour. A reminder that the next In Focus field event at the Obs takes place between 10am and 4pm tomorrow, Sunday 4th January 2015. The see-saw conditions of late December certainly remain established, with unbroken sunshine replacing yesterday's uniform gloom. The birding remained rather static, with most of the regulars putting in appearances for those out looking: 4 Purple Sandpipers and 2 Blackcaps were at the Bill, a Grey Heron and the Pheasant at Southwell, 2 Blackcaps and 2 Goldcrests at Pennsylvania Castle, a Black Redstart at Portland Castle and 15 Black-necked Grebes, 4 Slavonian Grebes, 4 Eider, 3 Great Northern Divers and singles of Red-throated Diver, Red-necked Grebe and Black Guillemot scattered about Portland Harbour. Although it's been enticingly mild for a couple of days the overnight wind and rain hadn't looked at all promising for moth-trapping, so the first immigrant of the year - a Diamond-back Moth - was a nice surprise in the Obs garden traps. Despite less than pleasant damp, dreary and increasingly windy conditions the new year got off to a decent enough start, with several skuas being of particular note: at least 4 Greats and a Pomarine lingered/passed through off the Bill and another Great showed up at Ferrybridge. The sea also came up with 5 Brent Geese, 3 Common Scoter and 2 Red-throated Divers through off the Bill and the Black Guillemot, 4 Eiders and an assortment of divers and grebes scattered about Portland Harbour. 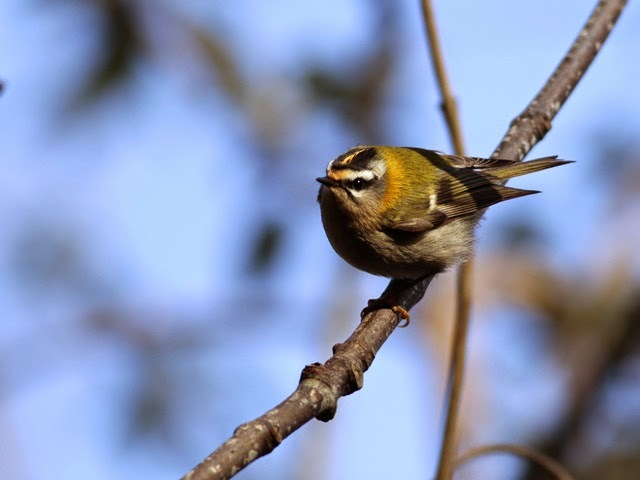 The relative shelter of Pennsylvania Castle came up with a nice haul of winterers, including 6 Goldcrests, 4 Chiffchaffs and singles of Great Spotted Woodpecker, Blackcap and Firecrest, whilst other long-stayers included the Pheasant at Southwell and 4 Purple Sandpipers and 2 Blackcaps at the Bill.